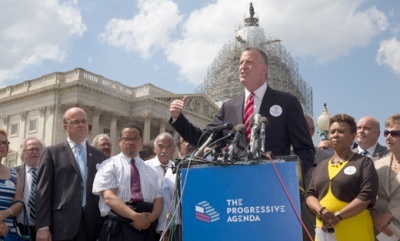 A group including New York City Mayor Bill de Blasio, labor leaders, and civil rights activists at a news conference on Capitol Hill in Washington, May 12 to announce the "Progressive Agenda." Saying "we need to reward work, not wealth," a group of union leaders, lawmakers and big-city mayors unveiled a massive grassroots campaign for "A Progressive Agenda" to attack income inequality and allied issues. Its convener and host, New York Mayor Bill de Blasio, provided that particular quote and the movement's initial goals - a $15 hourly minimum wage, paid sick leave and family leave, universal pre-kindergarten and after-school child care and closure of tax loopholes. But as speakers marched to the podium on a sun-splashed afternoon on May 12, the agenda grew. The group, including Communications Workers President Larry Cohen, Steelworkers President Leo Gerard, AFSCME President Lee Saunders and both teachers union presidents - AFT's Randi Weingarten and NEA's Lily Eskelsen-Garcia - said what they are really doing is riding a wave of national economic discontent and outlining achievable goals for advocates. And they also urged participants, including those in their own organizations, to take the crusade out of D.C. and back home, "street by street, county by county, city by city," in Saunders' words. "Mobilize, organize, educate." Added Gerard: "It's going to take hard work, lifting the floor for working people." "Our progressive agenda is a story about democracy, opportunity and a fair economy," Cohen declared. "It's about collective bargaining rights for workers, a higher minimum wage and increasing, not cutting Social Security. And most of all, it's about income inequality." Gerard, Cohen and Sen. Jeff Merkley, D-Ore., had added opposition so-called "free trade" pacts, without worker rights, to the agenda. "Fair trade for the 21st century ties together what unites us," Cohen commented. Rep. Rosa DeLauro, D-Conn., vowed to block fast-track in the House. Debate there has not been scheduled. "I challenge any member of Congress to show us a trade deal that gave us a net increase in jobs and a net increase in wages," Gerard declared. "They can't find it." Other items added to the progressive agenda included: Strengthening unions and the right to collective bargaining, by Rep. Keith Ellison, DFL-Minn.; debt-free college education, expansion of Social Security, "financing schools, not jails" and second chances at jobs for convicts who have served their terms, by de Blasio; "accessible and affordable health care" and a fairer tax code, by Merkley; enacting living wage laws and ending racial injustice, by Rep. Barbara Lee, D-Calif.; "reasonable gun (control) laws" by Oakland, Calif., Mayor Libby Shapp; and equal pay for equal work by DeLauro and Rep. Sheila Jackson Lee, D-Texas. "It's well past time to walk the walk," Weingarten, a New York secondary school teacher, warned lawmakers. "People have seen what the effects of 30 to 40 years of trickle-down economics have been. When you have building blocks" such as those the progressive agenda proposes, "We as teachers can then do our jobs," she declared. "We have to demand from the people who work for us" - the politicians - "that our kids have what they need to succeed," added Eskelsen-Garcia, a 5th-grade teacher from Salt Lake City. That means her students must be put in positions where they can learn, rather than worrying about where their next meal is coming from or whether their parents make enough. While the union leaders and lawmakers said they intend to make the Progressive Agenda a presidential campaign issue, one speaker, former 2004 Democratic presidential hopeful Howard Dean - who later became Democratic national chairman - said it's already having an impact. De Blasio convened a group of progressives in Gracie Mansion earlier this year to get the ball rolling and to brainstorm how to spread the movement and its message. It already has partially spread, Dean implied, to the party's leading presidential contender in the polls, former Secretary of State Hillary Rodham Clinton, though Dean did not name her. "There's gossip in Washington about trying to move a candidate in a certain direction," said Dean, who in 2004 - and in a line another speaker repeated at this session - said the progressives "represent the Democratic wing of the Democratic Party." "Well, she's moved a lot in this direction already," Dean added. Income inequality is the crisis of our time, and we need bold, progressive solutions to address it. By harnessing the strength of a national progressive coalition, and using that to achieve success in the three pillars of The Progressive Agenda, we will make sure that the voice of every American is heard – not just those at the very top. To do this, we must lift the floor for working people, help working parents, and champion a tax system that rewards work instead of just wealth. The Progressive Agenda is a set of proposals that build upon the work of dozens of economists, lawmakers and progressive activists, with the aim of addressing income inequality right now. Allow students to refinance student loan debt to take advantage of lower interest rates. D. Taylor - President, UNITE HERE!